The Steelers would receive the opening kickoff, but the Jaguars pass defense would force a quick three and out after three incomplete passes by Ben Roethlisberger. Starting at their own 43 yard line, Jacksonville would hand the ball off to Leonard Fournette five times and Blake Bortles completed two passes to Dede Westbrook, including an 11 yard touchdown. Jaguars take an early lead, on the road, 7-0. To make things even worse for Pittsburgh, Le'Veon Bell would lose a fumble on the first play of the drive. Abry Jones would recover at the Steelers 25. Bortles completed a 9 yard pass to Allen urns on 3rd down and Fournette would see another four times, including a 1 yard touchdown run on first down. With four minutes remaining in the 1st quarter, the Jags now lead 14-0. Big Ben and the Steelers offense would finally settle down, completing three passes in a row to Martavis Bryant (x2) and JuJu Smith-Schuster , picking up 44 yards. Bell would add an 11 yard run to move Pittsburgh to Jacksonville's 20 yard line. From there they would be forced to kick a 37 yard field goal. As we end the first quarter, the score is 14-3 Jaguars. The Steelers would force a quick punt before starting an ugly drive, derailed by two offensive penalties and a Yannick Ngakoue sack of Roethlisberger. Jacksonville would sustain a five minute drive on the back of five carries by Fournette, including two 3rd down conversions. Bortles would complete two passes to Marqise Lee totaling 20 yards, but even three first downs couldn't put the Jaguars in field goal territory and they would punt the ball, pinning Pittsburgh inside their own 10 yard line. On a third and 5 from inside their own 25, Antonio Brown would finally catch a pass, good for 18 yards, but the Steelers would again be forced to punt three plays later. With 4 minutes left in the half and starting from their own 23 yard line, the Jags would drive down to the Steelers 33 yard line, before Josh Lambo would kick a 50 yard field goal. The first half would end with Jacksonville leading 17-3. The Steelers would force a three and out to begin the second half and starting from their 40 yard line would score on their opening possession. It started with a 21 yard completion to Brown, followed by a pass interference and 27 rushing yards by Bell on four carries, including a 4 yard TD run. Momentum had started to shift in favor of the Steelers as they would force the Jaguars to go three and out on consecutive possessions. However, this time the Jags defense would stop the Steelers and get the ball back with 5:30 remaining in the third quarter. 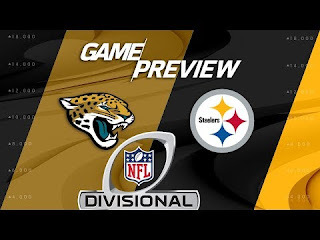 Five carries for 26 yards by Leonard Fournette, and two defensive penalties set the Jags up at the Steelers 6 yard line, before Bortles found Allen Hurns in the endzone for a touchdown. On the first play of Pittsburgh's next drive, Roethlisberger was picked off by Paul Posluszny, setting up Jacksonville with a first down from the Steelers 7 yard line. For some reason, Bortles attempted three passes in a row, all incomplete, leading to a 24 yard field goal. Jags increase their lead, 27-10. With a minute to go in the third quarter, the Steelers would fail again to get things going on offense. Jacksonville has the ball at the start of the fourth quarter, but a quick three and out gave the ball right back to Pittsburgh. Jacksonville was called for a huge defensive pass interference penalty, moving Pittsburgh into their territory, but would hold up and force a 49 yard field goal by Chris Boswell. The Jags would fail to convert a third and 7, but a beautiful punt would force the Steelers to start from their own 5 yard line, with nine minutes left. A 10 play drive was nearly derailed by two offensive penalties and a sack, but nine Big Ben pass attempts, would end with a 14 yard Le'Veon Bell TD reception. On 4th and 9 from inside the Jaguars 40, Roethlisberger found Bryant, good for 25 yards. Martavis had also converted a clutch 3rd down early on the drive. Antonio Brown picked up 42 yards on the series. Steelers cut the Jaguars lead to 7 points 27-20, with more than six minutes remaining. Pittsburgh would get the ball back quickly and find themselves in the middle of a 15 play drive, converting three 3rd downs, but failing to score on fourth down from the Jaguars 5, with a minute and change remaining. Big Ben completed seven of 14 pass attempts. Jacksonville would convert a 3rd down on their next series, and ran the clock out.